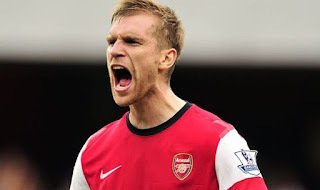 Arsenal captain Per Mertesacker has recounted his sweet memories of the FA Cup as Arsenal prepare to take on Preston North end. The German international took to Twitter to make an admission of how he so much loves the competition. He also attached a video of himself and his teammates lifting up the boss when they won the tournament some seasons back. He tweeted: "FA Cup time! Love this competition! Have some incredible memories of it with @Arsenal! " The World Cup winner will not feature in Saturday's third round tie as he has been ruled out for another three to four weeks. Mertesacker has not played for Arsenal at all this season and isn't yet close to a return. He is back in training but yesterday, Wenger stated that he has suffered a setback - a calf injury.